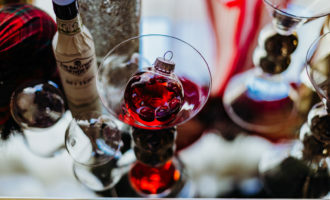 With the Fall season here, I wanted to start developing recipes that fit my criteria while remaining appropriate for the Autumn weather. After a recent trip to a local apple orchard, I decided to put our pickings to good use. First up, was dinner. I wanted to enjoy some of our apples in a savory dish, versus the sweet options that are in my regular rotation. 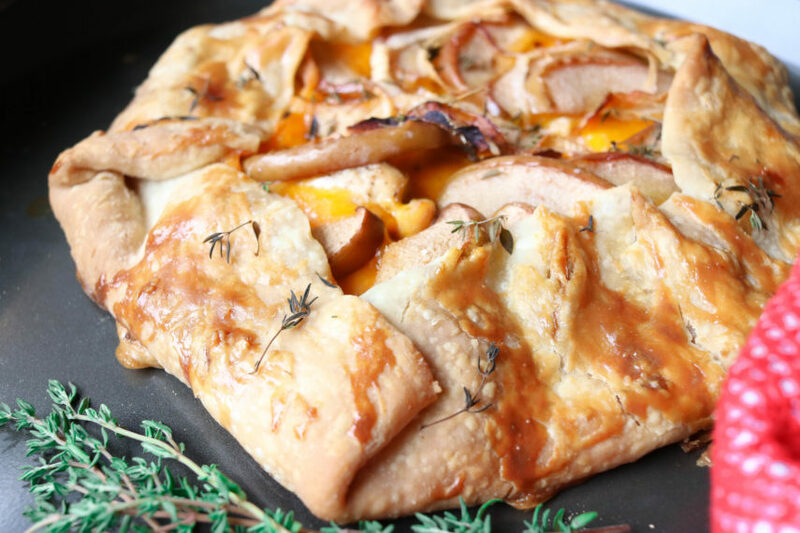 So, I chose to make a savory galette that included apples, chicken, cheddar, onions, and thyme. If you aren’t aware, a galette is a French pastry that is pretty much an open-face pie. 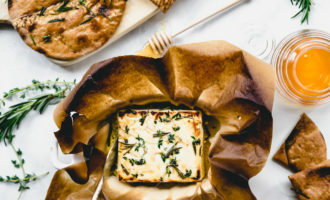 It’s traditionally made with fruit, sugar, and butter, but often you see savory versions that incorporate fruit, herbs, and cheese. It’s unique in the fact that it is freeform in design, so you can never really mess it up. Just wrap the dough around your filling and bake on a pan of your choice. Whatever you create is your masterpiece. What I like about this galette is that the apples don’t taste sweet at all. 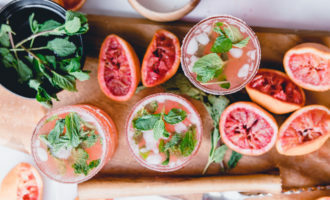 Once it’s mixed with the other ingredients, it meshes so well that you can possibly forget that they are in there. My husband doesn’t particularly care for cooked fruit, but he loves this dish. He’s always surprised that there are apples in the filling as well as on top. The cheddar and the onions bring it all together. When making this dish, I typically use pre-prepared pie crust/dough. As I mentioned, I’m usually a busy lady so, this option just makes life much easier. Honestly, it’s pretty flaky and taste really good. 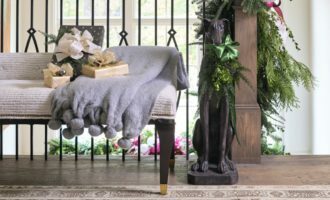 If I have time and patience on my hands, I go to my friend Martha…Stewart, that is. She has a great pie dough recipe that only has 4 ingredients. It’s fairly simple to prepare, just make sure that your butter is seriously chilled… trust me! Here’s Martha Stewart’s recipe if you decide to go that route. 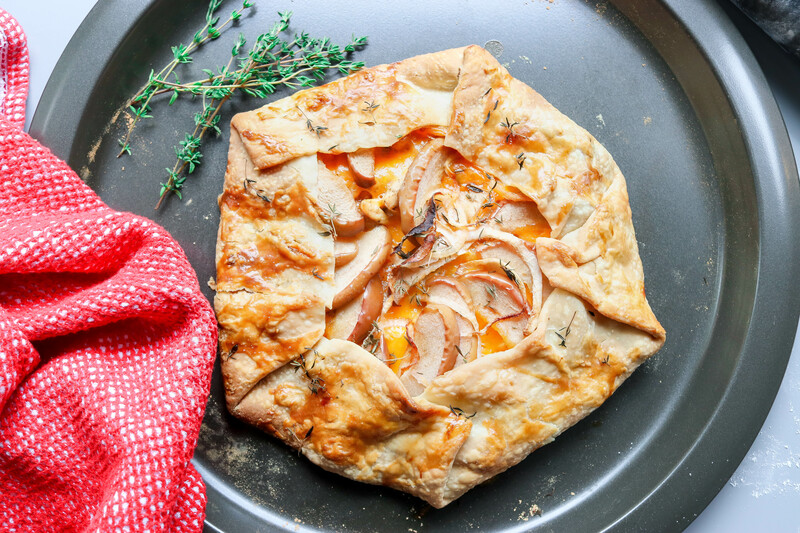 I hope that you enjoy this easy savory galette as much as I do. It always comes out beautifully and is a huge hit amongst family and friends. Here are a few tips to keep in mind when you give this recipe a try. When baking, keep an eye on the color of the galette. It should be flaky and golden when it’s done. If you want to make this vegetarian, leave out the chicken and replace with another 1/2 cup of apples and 1/2 cup of onions. Do not forget to take the sprigs of thyme out before baking. They’re ok to eat, it’s just not as pleasant to eat when it feels like you just bit into a mini stick. Make it pretty. 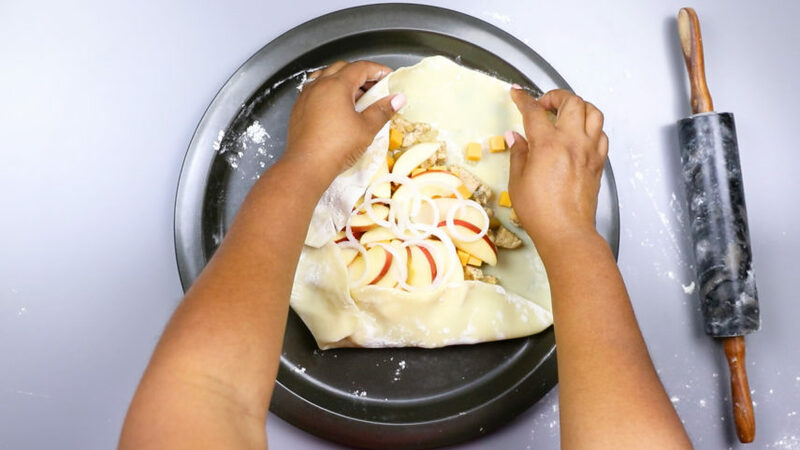 Get creative with your final touches of sliced apples and onion when finishing up the galette. Just be prepared to make two galettes. It’s really that good, and you may have people who want large slices. In a large skillet, saute raw onions and a diced apples in olive oil. Once onions and apples begin to soften, add diced chicken, pepper, salt, and thyme. While the chicken is cooking (about 8 mins), start to prepare pie crust. On a clean surface, sprinkle flour so your dough doesn’t get to sticky. Take thyme out of chicken filling. Pour chicken filling onto the middle of the pie crust. Add diced cheddar cheese on top of the filling. 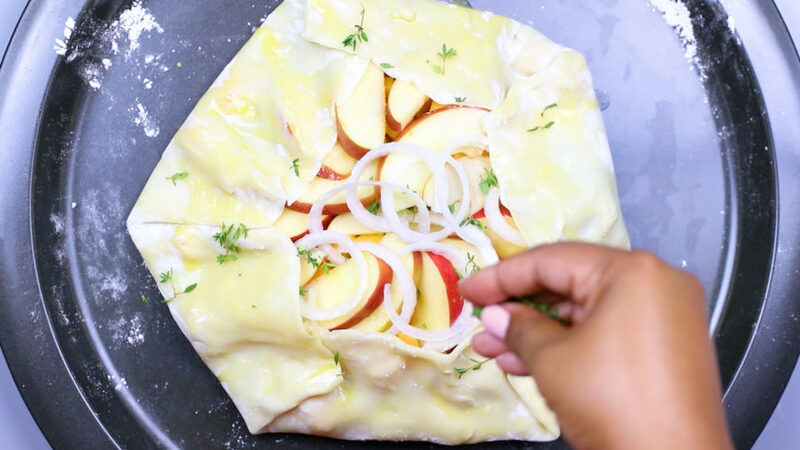 Make the galette pretty by adding sliced apple and sliced onion. Fold the outside of the prepared crust over the edges of the chicken filling. Pinch openings together so that the pasty does not fall apart. Ultimate it does not have to be perfect. The beauty is in it’s uniqueness. Sprinkle additional thyme on top. Bake for 25 minutes or until your crust is fully cooked and golden brown.